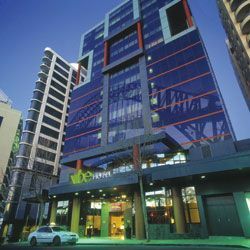 4.0 star rated Hotel Superbly located just a few minutes walk from North Sydneys CBD, Sydney Harbour Bridge and Luna Park, the prefect place to base your Sydney holiday. Facilities include outdoor heated swimming pool, sauna, complimentary use of north sydney olympic pool facilities and lane 9 gym, 24 hour reception, dry cleaning and laundry service, smoke free floors, parking, baggage hold, late checkout avaliable, and more. The hotel is situation on Sydney?s North Shore. Nearby there are a choice of restaurants and cafes.